How many stem cells do you need to form new cartilage? Most people and physicians would believe more is better. However, is that true, or just what we imagine should be true? A new study weighs in with the surprising results that less may be better. Let’s dive in. What Are Mesenchymal Stem Cells? Mesenchymal stem cells (MSCs) are adult stem cells that are found in many different tissues in the human body, such as bone marrow and adipose (fat). However, not all MSC sources are created equal when it comes to orthopedic treatments. While MSCs from both bone marrow and fat can be used to treat orthopedic conditions, MSCs from bone marrow are, by far, the preferred source for this. It’s also important to note here that while MSCs are found in fresh amniotic and umbilical cord tissues, they are not found in commercially available birth tissue products derived from amniotic or umbilical cord tissue. In other words, by the time they’ve gone through extensive processing, no living cells remain, so no clinic should be offering you live stem cell treatments for your arthritis or any other musculoskeletal issue using birth-tissue products; if they are (and, unfortunately, many are), it’s a scam. There are FACT guidelines I’ve covered previously for identifying live mesenchymal stem cells and avoiding amniotic scams. MSCs can differentiate into many specialized cell types, including bone cells and cartilage cells and much more. I’ve mentioned in prior posts that there are certain cell surface markers these stem cells either express (CD73, CD90, CD105, etc.) or don’t express (e.g., CD14, CD34, CD45). 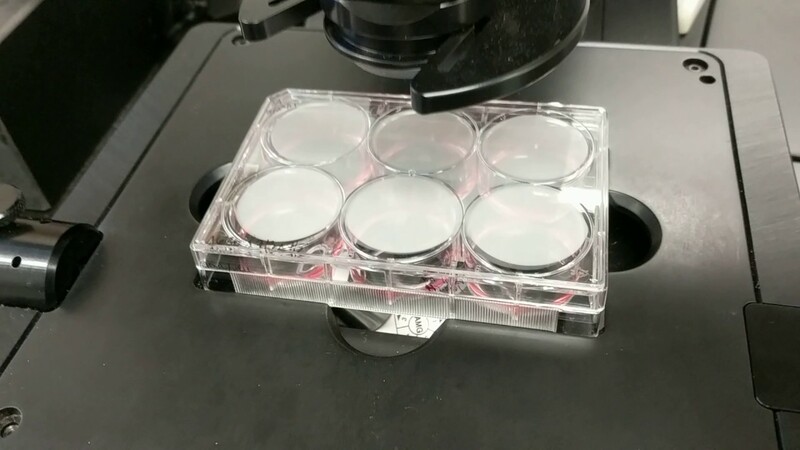 I’ve also explained another characteristic of MSCs is that they adhere to plastic, such as in colony formation in culture in the lab (see the video below for more on this). At the microscopic level, MSCs are spindle-shaped and have a fibroblastic morphology. If you want to really focus in further on mesenchymal stem cells at the microscopic level, watch my brief video below where one of our research scientists demonstrates MSCs under an actual microscope. What do Mesenchymal Stem Cells Look Like In Culture? To create specific complex tissues, such as cartilage and bone, individual mesenchymal stem cells (MSCs) cluster, or form aggregates, with other MSCs, creating tension with cell-to-cell contact. This process of forming MSC aggregates is known as condensation. The new study set out to determine if the number of MSCs involved in this clustering process (termed aggregate cell number [ACN]) had any impact specifically on tension level in its creation of cartilage tissue. In other words, does a higher initial MSC count equate to higher quality cartilage? The ACN was analyzed in a lab setting using a variety of initial bone marrow-derived MSC counts, ranging from 70,000 to 500,000. The results? Researchers found that fewer MSCs involved in the condensation process, or that formation of clusters, actually stimulated higher and faster differentiation of the stem cells into cartilage cells, increasing cell-to-cell tension contact, resulting in stiffer cartilage. In other words, the lower MSC counts within these clusters ultimately resulted in denser, higher quality cartilage tissue. Why is this important? Knowing higher quality cartilage may result from fewer MSCs in clusters as opposed to higher numbers of MSCs alone could define the dose for more advanced regenerative treatments for bone and cartilage in the future. The upshot? We may not need nearly as many MSCs as we thought to repair cartilage. This is a piece of good news, as this may be why we have seen small holes in the cartilage close with same-day bone marrow stem cell treatments that have far fewer MSCs than culture-expanded therapies (where cells are grown to higher numbers in the lab). What if I don't have any cartilage left in my knees? Haven't had a MRI so don't Know for sure . I had cultured stem cell treatment for a shoulder, and both knees at Regenexx Cayman with Dr. Newton 12 weeks ago. Does the new study advocate for same day procedures or a more diluted cultured stem cell formula? What evidence do you have that your procedures have actually produced cartilage?